The school system in India | Walk with us! This morning at breakfast we talked about the Indian school system. Here at Kumbalanghi we run a minor seminary, but at least at present it also includes the program for senior aspirants. To get in my head just how things work I asked if they would outline the Indian school system for me. First of all, as in many countries there are both public and a private schools. As in the States schooling starts with kindergarden. India has 4 and 5 year old kindergarden classes. Primary school runs from grade 1 to 7 and high school grades 8 to 10. Through grade 10, schooling is both compulsory and free. What we would call junior and senior year of high school is referred to as Plus 2. The senior aspirants are Plus 2 students. Ideally they would have their own house and formation program and that may be coming in the not too distant future, but for now there are senior aspirants at both of our minor seminaries (Gorantla and Kumbalanghi). Though the senior aspirants do have their own formation director (Fr. Vimal) and their own program, though the daily schedule is almost identical for both programs. Currently our philosophy students earn their BA in 3 years, usually majoring in literature in addition to their philosophical studies. There is some discussion because of changes in educational law will have students earn a BA before doing their philosophical studies.As you might imagine the quality of education depends on many factors. Similar to our own US experience the more affluent the school the better the education. The more rural or poor the school the more likely the quality will be less. The church, through religious communities, especially sisters’ communities, run many schools. These schools have always enjoyed good reputations for the education they offer. Here too is where English comes into play. You’ll see many schools advertise that they give their classes in English or teach English. However, advertising this and doing it is not always the same. English is important for several reasons given the influence of Britain on India since it was a colony for many years. Because of this, English is one of the common languages of the country. More important it became the language of education. Today Hindi is also an important language of education though again it in part depends on where you live in India. English is also important as it has become a common language in Asia, the lingua franca, you might say. Finally it is important because it is the commercial and business language as well. Thus you can see why parents who want their children to advance will look for schools that will give them a good foundation and one in which gives the student English proficiency. As for the SCJs, English is also important as it is not only the common language of the district but it is also the common language among all four of our Asian entities (Philippines, Indonesia, Vietnam and India). In closing, a word about the pictures I am am posting. The first is of one of our students, Ashwin Joseph. The other day he came up to me and introduced himself. He said that he did so so that when I come back I will remember his name! To make sure I wouldn’t disappoint him I took his picture just after the noon meal last Sunday as a way to keep his name fresh in mind.. Ashwin is in higher secondary school. 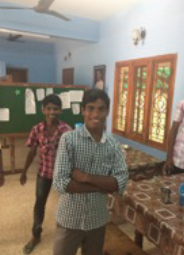 As I was taking his picture it was suggested I also snap one of Dileep since it was his 19th birthday. Comparing Ashwin and Dileep will give you a good idea of the age range currently here at Kumbalanghi. That is one reason why the district would like to have a separate house for the senior aspirants. Dileep has finished Plus 2 and the senior aspirant year is designed to give him an introduction to the SCJ community and its way of life. He will move from here to our house in Aluva next school year to begin his university studies and deepen his understanding of our SCJ charism and religious life. 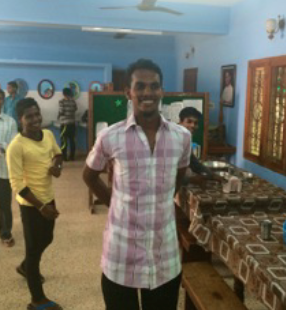 The photo of Dileep also gives you a view of the dinning hall. Note the row of sinks in the background. Eating with your hands (as is typical in much of India) requires washing well both before and after the meal.